An aerial shot of the filming site for "Western Sol," a short that will be filmed live during the eclipse on Aug. 21. Editor's Note: The start time for this livestream has been updated. A new Western-themed movie short will take place live during the total solar eclipse on Aug. 21, giving a whole new meaning to "riding into the sunset." The 12-minute short, called "Western Sol," will be filmed in a replica ghost town in Wyoming. It will be streamed live on Facebook and YouTube, starting at around 1:25 p.m. EDT (1745 GMT). Totality at this location will be at 11:38 a.m. local time, or 1:38 p.m. EDT (1738 GMT). More details are on the production's website. "They say that he owes him money — which is sort of shady, whether that's true or not — and they tell him that he can pay them back if he goes and robs the bank for him," Glass told Space.com. "The vague description of the rest is, 'He was given an opportunity to turn the tables.' The opportunity is, the sun goes behind the moon, and there's a distraction." About 20 people are involved in this project; most are based in Seattle and will drive 16 hours to the rural filming site in Wyoming. There will be a satellite truck available to stream the live feed from at least two cameras. Over the weekend, the actors and crew will extensively rehearse their positioning, in a process that is much like rehearsing for a play. Glass acknowledged that some people online may miss the short live broadcast because they're watching the eclipse, but he said the livestream will be archived online for later viewing. Glass first got the idea for an eclipse movie about a year ago, while visiting his in-laws and browsing magazines. He read an article about the upcoming eclipse and began to wonder how he could integrate that into a story. With no clear idea of what genre of film to pursue, he began researching sites near Seattle and then looked at locations farther and farther east. In addition to looking for places in the eclipse path, Glass wanted a somewhat isolated location because he knew there would be a lot of traffic on eclipse day, he said. When researching Wyoming, he found the ghost town on a film tourism site. "I thought about it for a moment — this could be a Western. This is a perfect spot," Glass said. "The location came before the story, which is a weird way to do it, but given the circumstances, it makes sense why." The location is near Dubois, Wyoming, a small town of fewer than 1,000 people that isn't far from the eastern border of Yellowstone National Park. 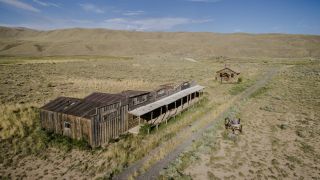 The "ghost town" is not a real ghost town, but a reconstructed one built on private property for events such as film productions. "The property owner is truly amazing," Glass said. "I told her about this project several months ago, and she loved the idea." The shoot will take place in rural Wyoming. Here, the crew prepares for the shoot ahead of the Aug. 21 eclipse. Glass — whose company has done small visual-effects bits for films such as "Oblivion" and "Terminator: Genisys" — then recruited volunteer crew and cast for the film. A partnership was also forged with Red Digital Cinema, which provided the video cameras and will promote the project on social media. This isn't the first science-themed passion project for Slackline Films; a 2015 short production called "Wrest" has a detective investigating a series of abandoned cars near Yakima, Washington. Editor's note: Space.com has teamed up with Simulation Curriculum to offer this awesome Eclipse Safari app to help you enjoy your eclipse experience. The free app is available for Apple and Android, and you can view it on the web. If you take an amazing photo of the Aug. 21 solar eclipse, let us know! Send photos and comments to spacephotos@space.com.